DELHI (Metro Rail News): The Delhi Metro Rail Corporation is planning to open a subway which connects Delhi Domestic airport’s Terminal-1 with Delhi Metro Magenta Line (IGI Airpot Metro Station) in July 2019. Currently, people need to cross a rough road between the T1 and gate number 3 of the Indira Gandhi International Airport station on the Magenta Line of Delhi Metro. 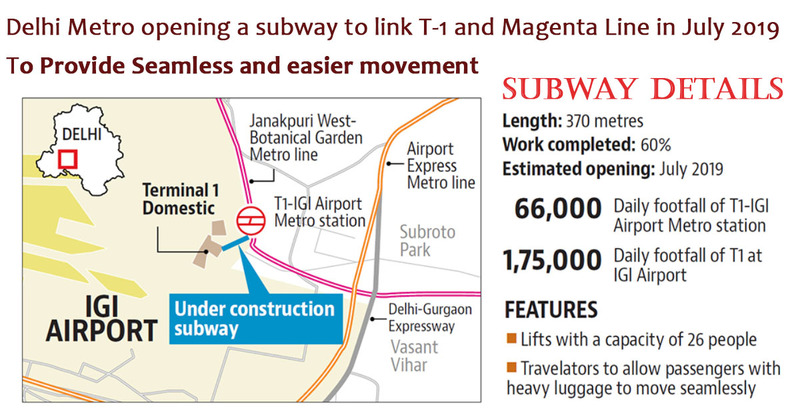 The Delhi Metro Rail Corporation (DMRC) expects to open the 370-meter subway that will connect the Magenta Line metro gate to the arrival and departure areas of the airport in July 2019. The subway will feature large elevators that can accommodate around 26 people and help in reducing the discomfort of dragging their luggage over road and exposure to the weather. About 60% of the work of the subway has been completed and the facility is expected to be thrown open for commuters by July, Metro officials said. Mr. Anuj Dayal, ED (corporate communications), DMRC said “Once the subway is open commuters will have easy access to the airport terminal from the Metro station. The subway will also be equipped with facilities such as escalators and lifts to ease the ride,”. “The work was expected to have been completed by January 2019, but the construction team encountered very hard rock necessitating the extension in deadline” Added Mr. Dayal. The subway also suffered from the expansion plans of the domestic terminals. This will become the first subway in the city to have travelators, Metro officials said. T-1 IGI Airport metro station of Magenta line gets a daily footfall of around 66,000 passengers, as per DMRC estimates. After the opening of the Terminal-1 of the Indira Gandhi International Airport station on the Janakpuri West-Botanical Garden line, the Delhi Metro had put up signage and paved the potholed road outside the station commuters at present have to walk with their luggage for 200 to 300 meters to reach the airport terminals from the metro station gates. Those exiting the gates of the station also have to cross a busy road to access the airport. The metro station, which was opened for public in May, last year, has three entry/exit gates. The gates have been strategically placed with the gate number-2 being closer to terminal 1-D and gate number three being closer to terminal 1-C.